First of all it has to be said that Blacksite is a very generic shooter that feels gameplay wise at least like something from the last generation of consoles. I love first person shooters, so as soon as this game dropped to a reasonable price (under £5) I snapped it up. The game starts 3 years in the past. 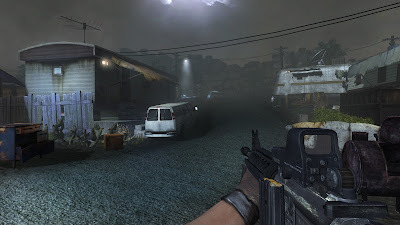 You play as Pierce a Soldier on a mission to uncover a biological weapons facility in Iraq. The facility is in an underground bunker, and it seems your orders were not correct as rather than chemical weapons you find what appears to be an Alien artifact. Coming under attack from strange bug like creatures you escape the facility, leaving a team mate trapped behind in the process. Present day and you are in Nevada where the Army has been called to put down a uprising in the Town of Rachael that has been sealed off from the outside world. Heading there you start to encounter creatures and events that share a spooky similarity to what happened in Iraq. Someone is withholding information from you it seems. The game is very generic. It uses the Halo method of only being able to have two weapons at a time. The locations are not too bad, no bland warehouses which is a relief. Instead you get Army bases, Government buildings, and several gas stations as well as the obligatory final location of a well defended bunker (similar to F.E.A.R, and Black's last levels) The enemies remind me of Half Life's soldiers; faceless people with no regard for their lives. 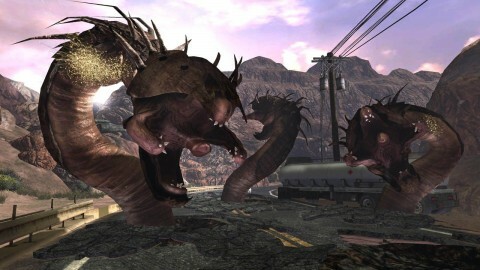 Later on into the game Gears of War/Lost Planet style giant monsters make an appearance that of course can only be killed by a rocket launcher that is coincidentally in the area. It is the sort of game where if you man a lone gun emplacement enemies will suddenly materialise from nowhere to swarm towards you, just like what the early Medal of Honor games did all the time. The game is quite glitchy, weapons float in the air, and at one point I even managed to drive a jeep along the sky. The games load times are really long also which is another annoyance I found. Talking of weapons; this game hardly has any. There are five weapons in total, no joke! You get the choice of a Pistol, Machine Gun, Sniper Rifle, Shotgun, and Rocket Launcher. Wow, so much choice. Enemies mainly consist of faceless mutant soldiers, also small creatures that blow up when shot are a plenty, as well as insects that look identical to the ones from Half Life 2. There are also tall cyborgs that look quite cool. Other than these the aforementioned Lost Planet monstrous blobs and tentacles make an appearance, complete with glowing weak spots. The plot is not really anything to shout about. The first level, and the drive to Rachael is well done as snippets of twists are revealed to you, rather than explained via cut scene. Talking of cut scenes; there are not any, the game uses Call of Duty/Half Life scenes in which characters talk, but your silent protagonist is free to wander around and get bored. The game features slightly more than just first person shooting. At fixed points you get to man a gun from a vehicle which are amusing diversions. You also get to drive a jeep at several points in the game, notable the route to Rachael, fun enough. 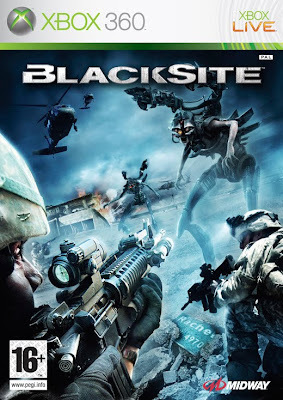 There is multiplayer, and I did actually attempt to play it, but to be honest absolutely no one in the Universe is playing Blacksites multiplayer anymore (if they even ever did). Blandness is the ultimate killer of this game, there just are no new ideas at all. It looks pretty enough (shame about the totally forgettable musical score), but gets boring far too quickly.